Some Paintings Don’t Make It – Let's Paint Nature! This morning I was all excited about the Canyon Columbine I found last Tuesday. I tried to make a pastel painting but was very frustrated on the outcome. So frustrated it ended in the garbage. It happens. What did I do? Well, after I couldn’t get my painting to work, I ate something really bad for me (comfort food). Then I sulked. When my pity party was over I came to my senses…finally…and started over. Get behind me, negative thinking! I decided to change my medium to watercolor and start over. I think the busy background (canyon wall) of my original photo was too much. 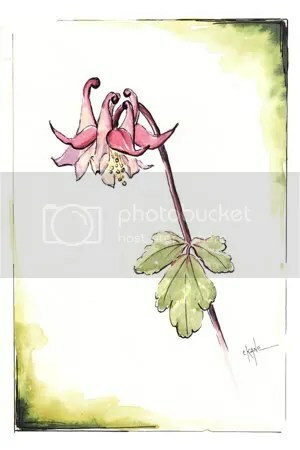 I am very pleased with this simple watercolor columbine painting. If you allow negative thinking, fear, or hopelessness to win, you will never reach your goals. Life is just too short for that to happen. Press on and try again. You can do it. Have your own personal pity party then quickly move on. County. You bring it to life for all to see. I can’t imagine that your previous attempts could have turned out that badly! The COlumbine is such a beautiful flower, and you have such skill that it is impossible that you could have botched the first two. Lovely, inspirational picture and words. Thank you for both. And, no, I did not know Chicago had a canyon other than the downtown canyons of tall buildings. Lana: Yes that is true! Watercolors are pretty unforgiving.